Announcement Hello everyone, we do custom orders! Hello everyone, we do custom orders! We absolutely LOVE our farmhouse dining room table! It is exactly what we were hoping for, & it looks exactly as the seller described. We opted to make the drive to OH to pick up the table, to save on shipping costs. It ended up taking a week longer than we had originally discussed, but it was worth the wait. 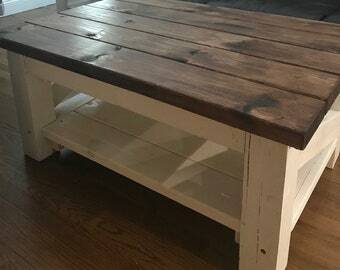 When we got it home & unwrapped we noticed that the stain wasn’t completely dry, & the wrapping had left its mark on the table top. We wiped it down with paper towels, & had fans running in the house for a few days to combat the fumes. We ate our first meal here about 4 days later. We have decided to add one more coat of polyurethane (this was not something discussed with the seller) just for our own personal preference. 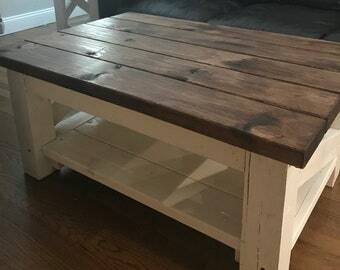 We recommend this shop, if you’re looking for a rustic table. 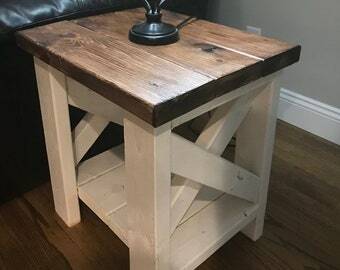 I was going to leave a completely negative review for this seller but the table is exactly what I wanted. It is sturdy, well-built, and I was able to order it precisely to my specifications for a reasonable price. It is a beautiful piece and so are the benches. The seller even threw in an extra bonus piece. The seller did not give shipping updates unless I asked for them, though. He assured me my table would be ready by a certain date and then told me it wasn't ready and it would be another week before it shipped. He also told me he shipped it, and after I didn't receive it in a week's time, I found out he hadn't actually shipped it yet. In the end, I had to wait a month for my table. and was told it would be two weeks, and was lied to about the actual date it shipped, but my table itself is absolutely perfect. Absolutely love my new table ! Would recommend!! Redoing furniture in free time.